The pampiniform plexus (from Latin pampinus, a tendril, + forma, form) is a network of many small veins found in the human male spermatic cord and to a lesser extent the suspensory ligament of the ovary. 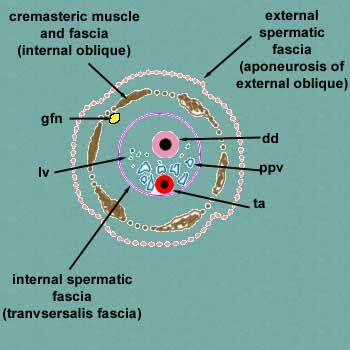 In the male, it is formed by the union of multiple spermatic veins from the back of the testis and tributaries from the epididymis. In females, the pampiniform plexus drains the ovaries. The right ovary drains from the plexus to the ovarian vein and then to the inferior vena cava. However, the left ovary drains from the plexus to the left ovarian vein, and from there drains to the left renal vein before emptying into the inferior vena cava. The veins of the plexus ascend along the cord in front of the ductus deferens. Below the superficial inguinal ring they unite to form three or four veins, which pass along the inguinal canal, and, entering the abdomen through the deep inguinal ring, coalesce to form two veins. These again unite to form a single vein, the testicular vein, which opens on the right side into the inferior vena cava, at an acute angle, and on the left side into the left renal vein, at a right angle.The pampiniform plexus forms the chief mass of the cord. 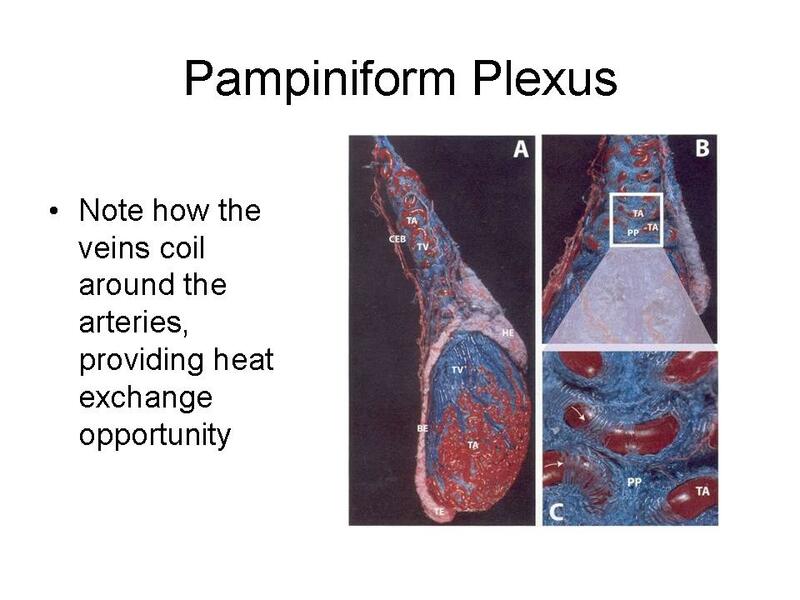 In addition to its function in venous return from the testes, the pampiniform plexus also plays a role in the temperature regulation of the testes. It acts as a countercurrent heat exchanger, cooling blood in adjacent arteries. An abnormal enlargement of the pampiniform plexus is a medical condition called varicocele. ^ First Aid for the USMLE Step 1, 2013. 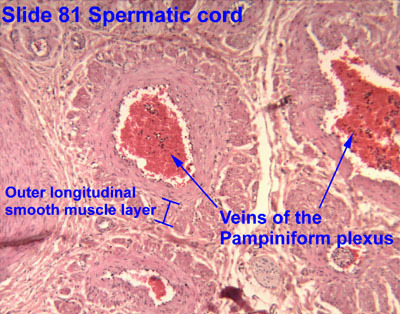 Anatomy photo:36:st-0701 at the SUNY Downstate Medical Center - "Inguinal Region, Scrotum and Testes: Veins"
Histology image: 81_05 at the University of Oklahoma Health Sciences Center - "Spermatic cord"